Spider-Man is chock full of collectibles. You’re meant to grab tokens from fighting crime and clearing out bases to upgrade and build new suits for Peter Parker. My favorite collectible, though, is the mementos you find in Peter Parker’s backpacks around the city. These backpacks aren’t hard to find; they’re not especially cleverly placed or hidden. The pay-off for picking them up is that they contain little pieces of Peter Parker’s past within them. I’ve always liked Peter Parker as a character. As a shy nerd that wanted to do good, I connected to him as a kid, as a teenager, and even now, as an adult. His selflessness is admirable, and adult-me in particular relates to his hustle between several side gigs as he struggles to maintain a relationship with his girlfriend. He’s often depicted as a no-nonsense good kid, even before his Uncle Ben died and before a spider bite spurred him into superhero-dom. Even while coping with his grief for his uncle, Peter remains willing to put his life on the line for the greater good. 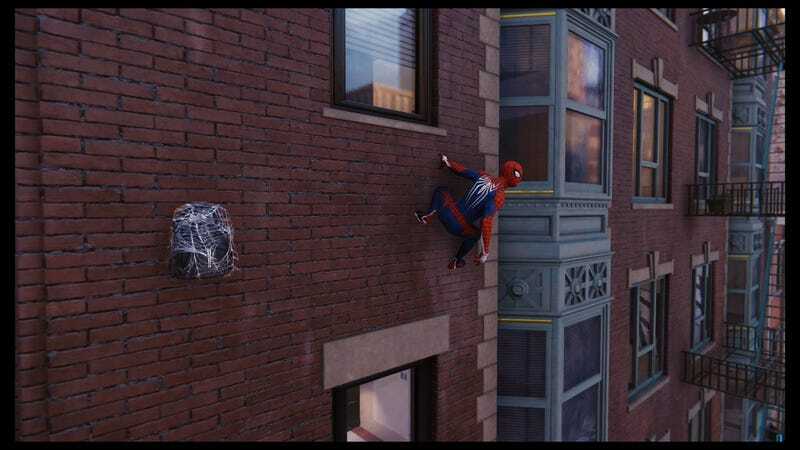 To me, that’s what heroism is, and Peter’s good natured, humble, just-a-kid-from-Queens attitude always made me feel like I could be a hero, too. This Spider-Man game shows us Peter at a point in his life where he’s really figured out the whole superhero thing. We enter his story after he’s found himself, and while I’m relieved to not have to sit through another version of the Spider-Man origin story, I’m still fascinated by the glimpses into Peter’s past, courtesy of these old backpacks. There aren’t ever huge revelations within them, but they pepper in humanizing details that let me get to know Peter better as a character. The first backpack you find has a menu in it from his first date with Mary Jane Watson; when you take a closer look at this in the menu, Peter muses to himself that even now, after he’s been dating her for years, he wishes he could have taken her somewhere nicer. In another backpack, Peter finds remnants of an old suit with some under-arm webbing that he laments didn’t really have a functional purpose but definitely looked cool. Another bag contains a visitor pass from Oscorp from when Peter interviewed for a job there; to this, he says, “It would have paid well, but Dr. Octavius offered a chance to really make a difference.” When Peter finds a bag with a selfie of him at the top of the Empire State, he says that being Spider-Man didn’t make his fear of heights go away. These small remarks tell me so much more about what it’s like to be Spider-Man, and also to be Peter Parker, than beating up thugs and stopping drug deals. For Peter, being a hero is about valuing the people in your life that you love and choosing the wellbeing of the many over your own personal gain. It’s doing things even though they scare you. The backpacks paint a grounded and real-life picture of Peter, which makes it easier to remember that, hey, I can do these things in my real life, too. I don’t need to have been bitten by a radioactive spider to make the world a better place. I can choose to do the right thing, and to help others, all on my own. Taking down supervillains and swinging through New York is thrilling, but every time I see a backpack in Spider-Man, I make a beeline for it. I love being Spider-Man, but more than that, I love understanding Peter, and understanding how I can be more like him.